With the rainy seasons in southern Arizona come flowers and weeds. Like many yards in Tucson, during months with the most precipitation, my yard has lots of both. 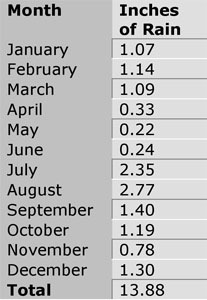 Below are pictures from my yard in early February and a chart with the average inches of rainfall per month for Pima County, which I created using information from The National Weather Service (see Internet information below). Let's take a look and see what there is to know about weeds. Public Domain. Created by Rylan Higgins, 2005 using information from The National Weather Service. What makes a plant a weed? Why do weeds appear only at certain times of the year? Where do weeds come from? Do they have scientific names? Are all the weeds in your yard native to Arizona? 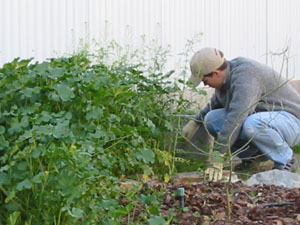 How do the people living at your home interact with weeds? According to the Bureau of Land Management and other people who write about weeds (see Internet information below), a weed is a non-native plant. It is considered invasive because it takes over the habitat of native species, often killing them off. It is no surprise then that much of the literature on weeds is about how to eradicate (get rid of) them in order to protect native ecosystems and gardens. 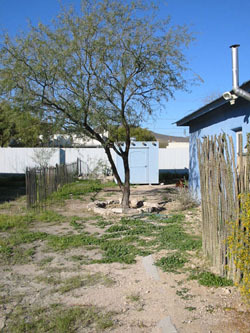 Two plants commonly found in Tucson yards provide a good example of the difference between native and non-native. 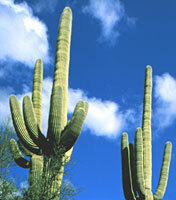 Saguaro cacti are well adapted to the desert and are considered native. On the other hand, orange trees, which are commonly grown in Arizona, require a lot of water. They are non-native. Cereus giganeus. Saguaro cacti are native desert plants. The term "weed," then, does not apply to all non-native plants. People do not consider orange trees weeds, for instance, even though they are non-native. People commonly use the term weed to mean a plant that they do not want in their yard. By this more common definition, several "non-weed" plants in my yard are also non-native, so I'm not worried about whether the weeds in my yard are invasive. I'm simply interested in learning more about them. Let's think about the weed in this picture. It arrived in my yard in early February. I didn't know where it came from. I didn't know whether it was native. But I did know that my roommate planned to get rid of it. I think we should do some research and learn more about this weed, and find out why my roommate doesn't want it hanging around the yard. Before we go any further we should try to determine the species of this weed. There is a great resource for this on the web. Kittie Parker has provided her illustrated book about Arizona weeds online (see Internet information below). I went to her site to find the weed in my yard. After a little looking through illustrations of weeds common to Arizona, I came across a sketch that looked a lot like the weed in my yard. Reading the description and viewing the picture available in Parker's book confirmed that my weed is Malva parviflora L., which is the scientific name for the plant commonly known in Arizona as little mallow or cheeseweed. I like the name little mallow best. 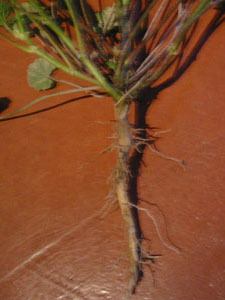 Malva parviflora L. Little mallow's taproot. Copyright © 2005 Rylan Higgins. Malva parviflora L. Little mallow after being pulled. According to Parker, these plants are a "stout, bushy annual or biennial, branched and spreading from the base." They range from 1 to 3 feet in height and have a short thick taproot, and this species reproduces only by seeds. 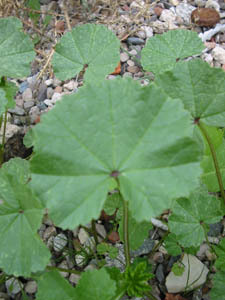 Its large soft leaves are almost circular with 5 to 7 shallow lobes and toothed edges. 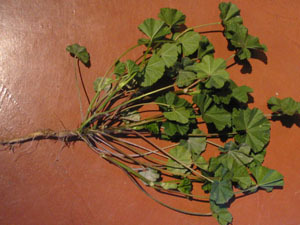 Little mallow's leaves are 2 to 5 inches wide and its stalks are 4 to 10 inches long. Malva parvilofra L. This image was created by scanning a mallow leaf. Copyright © 2005 Rylan Higgins. Malva parviflora L. Close-up of little mallow leaf. Copyright © 2005 Rylan Higgins. 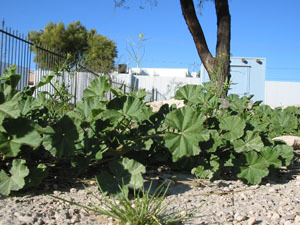 Parker also points out that little mallow was introduced from Europe and is common throughout Arizona. It likes somewhat moist soil composed of clay, silt and sand and can grow at elevations of 100 to 8,500 feet. The plant flowers year-round, but is likely to do so between November and June at lower elevations. According to Parker, the plant and seeds, when eaten by hens, are said to cause pink egg whites. We've clearly increased our knowledge of this weed. After a closer look at little mallow, it would seem that my yard is similar to other ecosystems. It has the ability to sustain an organism well adapted to the conditions offered in the soil around my house. But what about my roommate and her plans to rid our yard of a species that is well suited for it? As it turns out, she wants our yard to look nice and points out that little mallow simply does match with her idea of beauty. I suspected that this might be a common attitude in Tucson. To find out just how common, I called a local landscaping company and asked a worker there about weeds. She said that one of the most frequent requests the company gets is to have weeds cleared from yards in Tucson. I guess my roommate is not alone in her attitude about weeds. So, we'll have to wait until the next rainy season, when little mallow will very likely be back around. In the meantime, visit the Malvales page on the Tree of Life to learn about other plants related to Little Mallow. Just click on the link to Malvales in the top right corner. An Illustrated Guide to Arizona Weeds Learn more about weed species native to Arizona with this online book. Parker, Kittie F. 1972. Tucson: University of Arizona Press. National Weather Service Learn more about climate patterns in southern Arizona. Climatologist of Arizona Learn more about climate patterns in southern Arizona. National Geographic Go to National Geographic online and do a search for "weeds" to find out about programs on weeds. 1) Heiser, Charles B. 2003. Weeds in My Garden : Observations on Some Misunderstood Plants. Portland, OR: Timber Press. 2) Parker, Kittie F. 1972. An Illustrated Guide to Arizona Weeds. Tucson: University of Arizona Press. 3) Zimdahl, Robert L. 1999. The Fundamentals of Weed Science. San Diego: Academic Press. This Treehouse encourages students to explore species in their yards and neighborhoods. 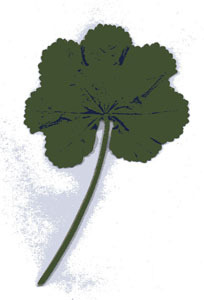 Focusing on one weed, little mallow, it provides an example of a ToL Biodiversity Exploration Investigation. This Treehouse details the process of learning about a species, about which the author previously new very little, through observing, taking photos and reading about the organism. The author identifies the species and explores the concept of what is, and is not a weed, as well as what is considered a native plant.